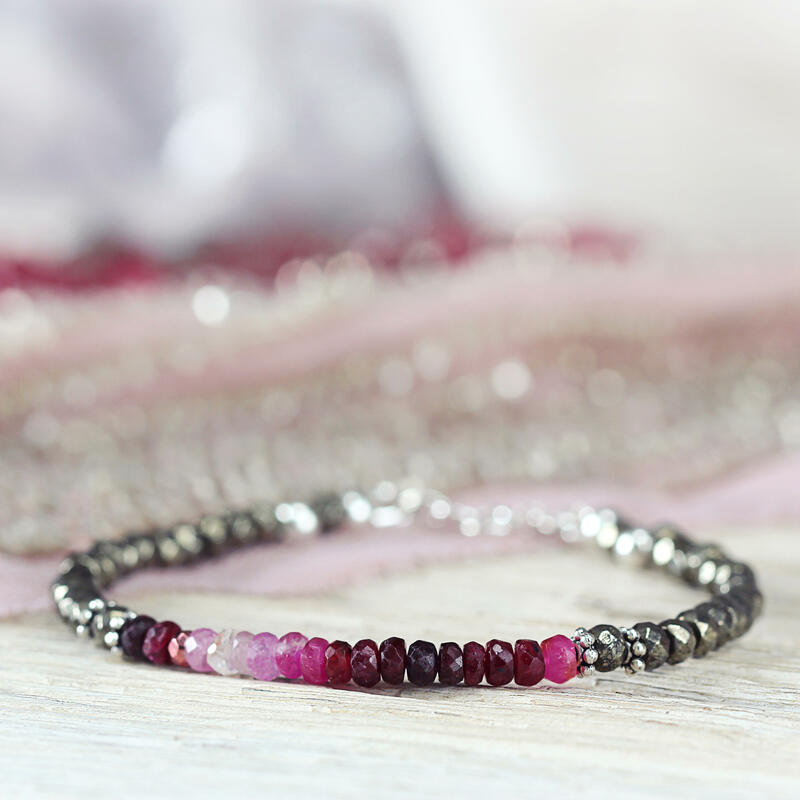 This ombre Ruby bracelet is a gorgeous mix of earthy elegance and sparkle. 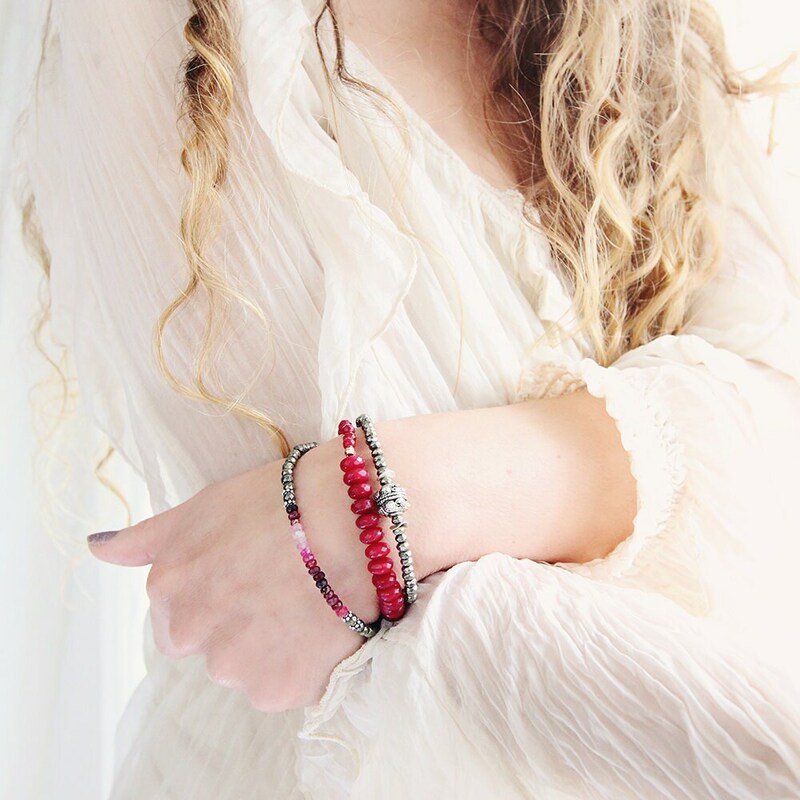 This stunning bracelet works equally well for all seasons and styles, whether you're going glamourous for a special occasion in the winter months, or headed for a barbecue or the beach during the summer time. It will easily transition from day to night to totally transform your look. 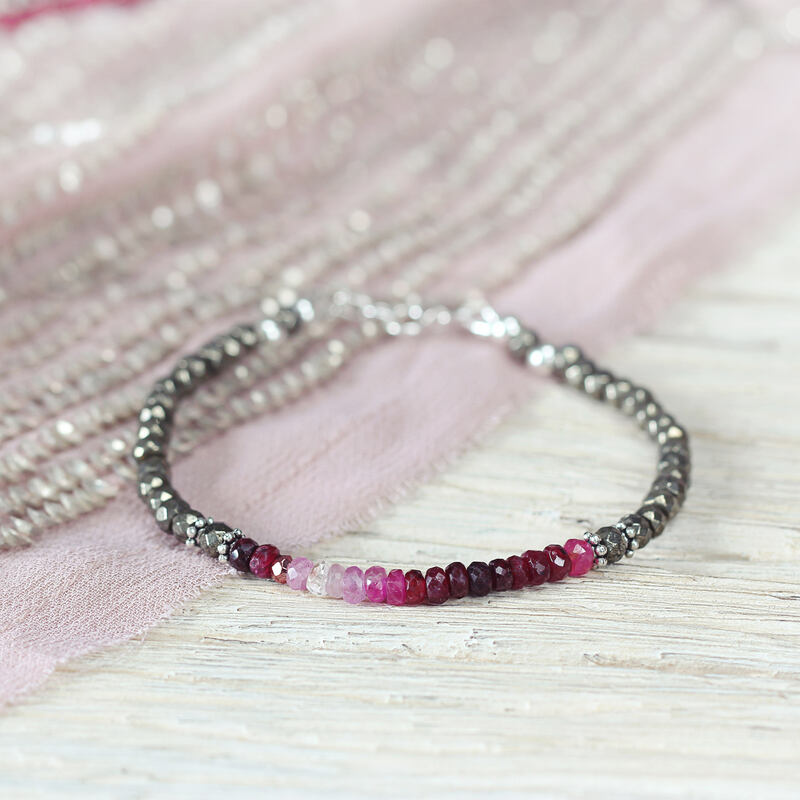 Featuring beautiful, finest quality AAA, hand-cut Rubies which have been carefully chosen and strung in a striking 'ombre' effect. The graduated shading ranges from the palest, prettiest pink through to rich ruby red to the deepest darkest red. These beautiful Rubies are 3.5 - 4mm and hard to find in this quality at this size. 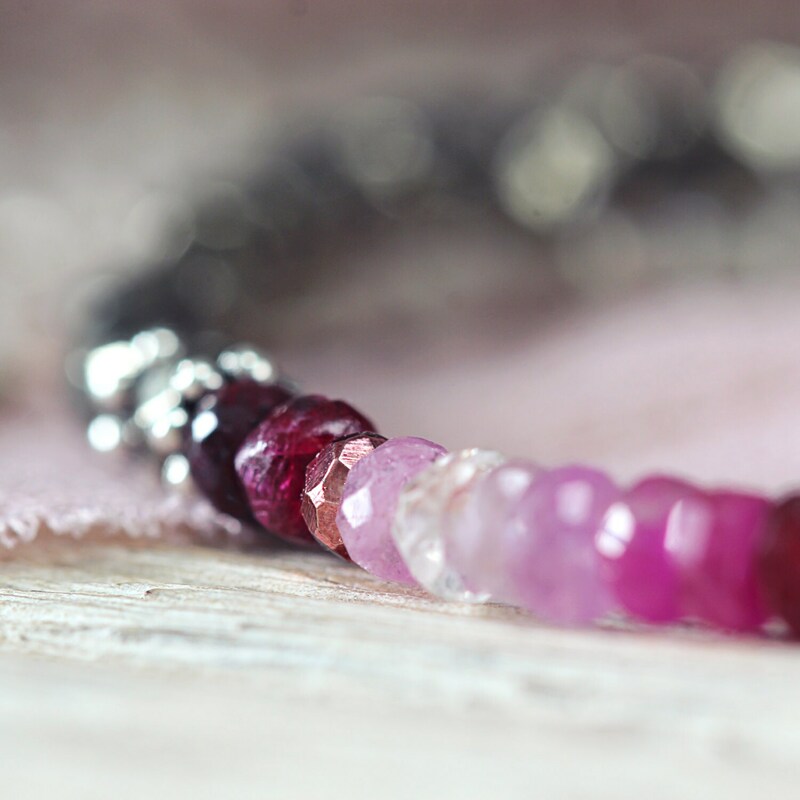 A little pink pyrite bead can be found amongst the Rubies, just to break up the pattern and add a surprise detail. Framed either side by sparking sterling silver accents and a swathe of Pyrite stones. Finished with a sterling silver clasp, this bracelet measures approximately 7 inches / 17.5 cm in length, and you can choose to add an extender chain for a longer, adjustable length. Rubies are the birthstone for July and the 40th wedding anniversary. 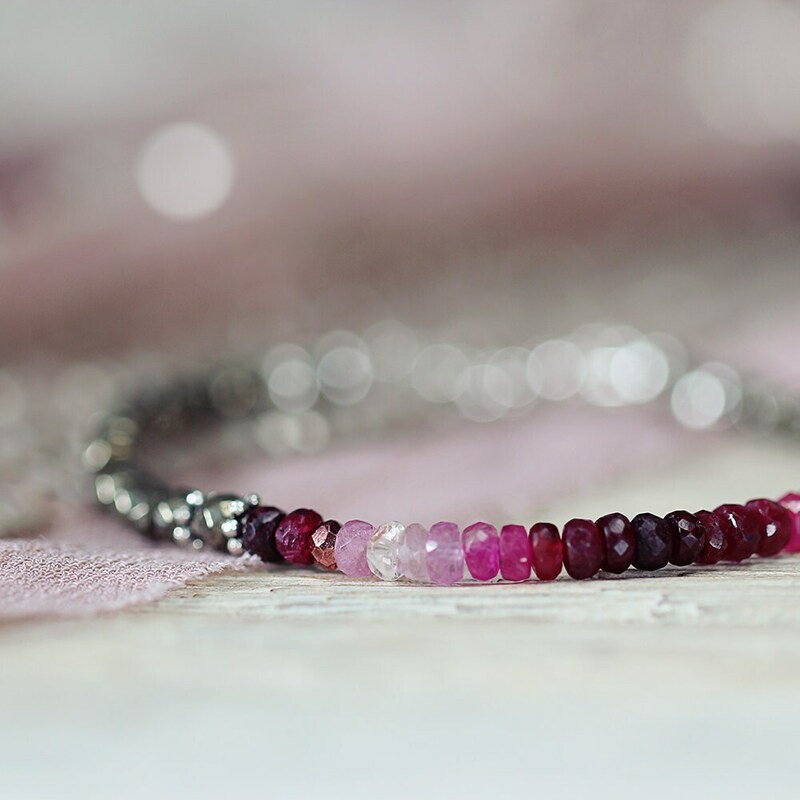 Ruby jewellery makes a perfect romantic gift for a loved one, whether for a birthday, anniversary or Valentine's Day, as Rubies have always been associated with love and passion. In fact, throughout history, Rubies were considered to be perfect wedding stones. * Sapphire beads measure approx 3-4mm.